Thursday , March 17th LIVE @ The Dirty Grind! Hey there you lovely bunch of music lovers! We at The Dirty Grind Independent Artist Community invite you to join us for 5 solid hours of live music!!! 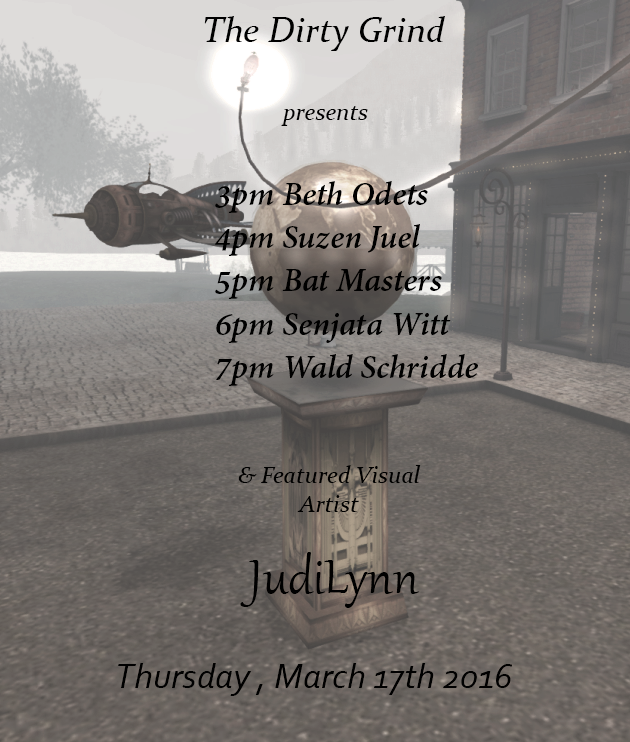 While you’re listening to the awesome tunes provided by the wonderfully talented artists that grace the stage, please take a gander at our Featured Visual Artist JudiLynn’s amazing work. Before the In-house Performances, pay these artists on your Thursday Field Trips! 9am @ Kickin – The Vinnie Show! 11am @ Cafe Musique – Bohemian! 12pm @ The Blarney Stone- Wald Shridde! ← Wednesday March 16th LIVE @ The Dirty Grind!